This FM 2014 Player Profile of Erik Lamela shows one of the worlds top talents, used to deadly effect as inside forward with his dribbling and fast feet. During my test save Lamela developed outstanding attributes across the board. To name a few he had 19 in dribbling and 20 in flair, other high stats were achieved in long shots, technique and creativity. To be honest, he’s a complete all rounder, a rare gem that can take on his man and then finish whether its from close range or the edge of the area. I think this wonderkids career history speaks for itself as he guided Tottenham to consecutive titles scoring 10 or more goals every season bar one and adding plenty of assists. The nearest thing to Messi this year? Could well be…just a major shame Tottenham already grabbed him, that makes the asking price a ludicrous £140 million at least and Lamela very difficult to sign. But, when a player like Lamela signs for a club like Spurs at the games start, we can simply right them off for a season. Besides, he can be available for less than £30 million after a few seasons so hold tight and keep your eyes peeled. Erik Lamela Age: 21 Position: AMR/MR/AMLC Role: inside foward / advanced playmaker / winger Club: Tottenham Nationality: Argentine Value: £16 million Price tag: £140 million (in patch 14.3) CA: 152 / PA: 180 Erik Lamela profile in 2013 (after starting new game, 14.3) Erik Lamela profile aged 28 in the year 2020 Erik Lamela career history until 2020 This FM 2014 Player Profile of Erik Lamela shows one of the worlds top talents, used to deadly effect as inside forward with his dribbling and fast feet. 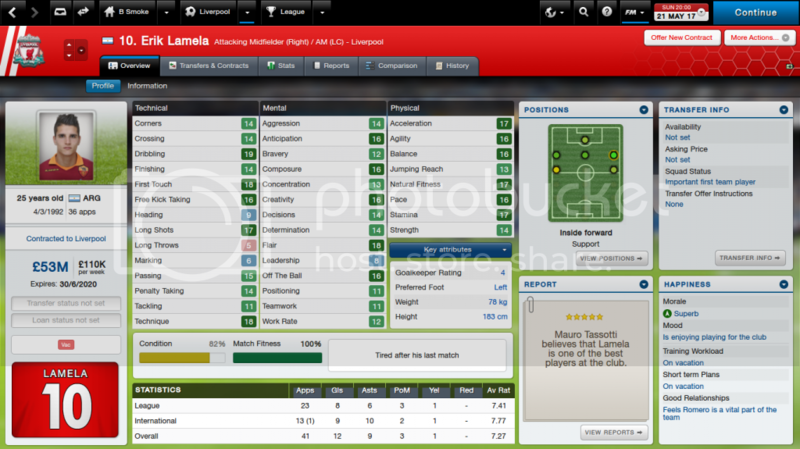 During my test save Lamela developed outstanding attributes across the board. To name a few he had 19 in dribbling and 20 in flair, other high stats were achieved in long shots, technique and creativity. To be honest, he's a complete all rounder, a rare gem that can take on his man and then finish whether its from close range or the edge of the area. I think this wonderkids career history speaks for itself as he guided Tottenham to consecutive titles scoring 10 or more goals every season bar one and adding plenty of assists. The nearest thing to Messi this year? Could well be...just a major shame Tottenham already grabbed him, that makes the asking price a ludicrous £140 million at least and Lamela very difficult to sign. But, when a player like Lamela signs for a club like Spurs at the games start, we can simply right them off for a season. Besides, he can be available for less than £30 million after a few seasons so hold tight and keep your eyes peeled. He looks amazing. Reckon with a bit of training he would make as good an out and out left winger for those of us that don’t like inside forwards? Yeah he can be very versatile down the wings with good training. Yeah I’d say your right, Balanta ticks all the boxes for me. Who would be your pick for the right wing spot? Lamela vs Shaqiri ?? That’s a tough choice, depends on what you want…if you want someone to hug the touchline more and get a cross in then Shaqiri but if you want someone to cut inside then Lamela. One of the best players this year, signed him for £26 million during my 3rd season with Newcastle, he’s been absolutely insane so far and if you ask me for a bargain price. He’s definitely one of the best players, one of few who can pull it out of the bag when a game looks lost. He is a great player indeed. As for the apostrophe that was my trigger happy clicking through spell check, didn’t register I’d done that, corrected it now. Yes I believe he is as an inside forward, at least potentially anyway, I’d got for Lamela for the promise of what he can become. what about between lamela and el shawary??? Couldn’t say, they are both very similar in talent and style. is you had the money and had to choose one who would it be??? lamela draxler shaqiri or el shrawry? I don’t really like these questions, there is no right answer as it will vary in every single game on tonnes of different scenarios. Hence my answer, which I’ve already given you, looking at the layers on their own, I wouldn’t prefer one over the other. Could he possibly play as a false 9 up top in your 4-5-1? Maybe with a bit of training on heading? I was going to say I wouldn’t recommend it but it would work with training. However, you are correct, Costa does look like a real beast. I will profile Ledson at some point yes and Halilovic is already scheduled for Friday I believe. Thanks for the heads up, its sorted. played lamela on the right of my attacking 3 chadli erikson/sigurdsson and lamela and was ultimately disapointing in the first season eventhough i finished 2nd, aaron lennon was more consistent. Well its absolutely insane in my Newcastle save after a few seasons. i have lamela as inside forward, diego costa as deep lyingforward and soldado as advanced forward! tons of goals! even from soldado. He should be amazing given time, was for me.